Can one see real Middle Ages in Berlin nowadays? Berlin doesn’t have a castle and no cute frame houses. 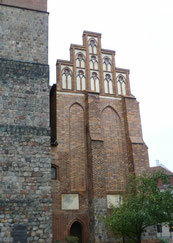 You have to look very closely, to find real Middle Ages in Berlin! Let’s go and trace it together! This guided tour is offering you the following original medieval places: Church, place of trial, city wall, monastery – plus a lot of history and stories, including historical pictures and city maps. 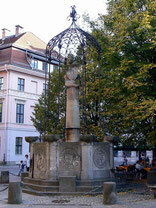 Part of the tour are Elector Frederick „Irontooth“ and the so called „white lady“, the house ghost of the City Palace. The tour lasts about 2 hours. Registration via E-Mail is desirable. Please register here. You can book this tour as a private guided tour for you and your group! and only on Saturdays or Sundays. The date is on agreement. Please contact me at least 2 weeks before your desired date. Fee for private guided tours: 10 € per person. Your medieval tour guide is Diana Schaal. The tour won’t take place in case of raining cats and dogs and not stopping at foreseeable time. Thank you very much for your feedback after the tour in my guest book here.